that Donna recommends and also Wish, Wonder, Surprise compiled by Eugene Schwartz (available at waldorfbooks.com) as my resource books, I taught this in a larger co-op class with my twins and my older daughter, and in a small co-op of just two with my youngest daughter. Although I prefer the group format, I believe that it could also be done individually with a child and did teach a similar main lesson individually to my eldest son. I augmented my resources with some online materials about poetry writing in general plus poems and examples of poetic elements which I copied for the students. The summary below is just one of many possible ways that this main lesson could be approached and focuses on a small or larger co-op format. 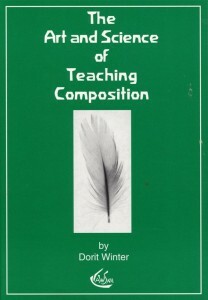 This was a three week main lesson, and I followed Dorit Winter’s The Art and Science of Teaching Composition framework of teaching ” Wonder” in week one, “Wish” in week two and ” Surprise” in week three. Each class in the co-op format was about two hours long. The approach that I took with my classes was to sometimes be a co-participant poet with the students, so I completed certain assignments and shared my own poem results with them. 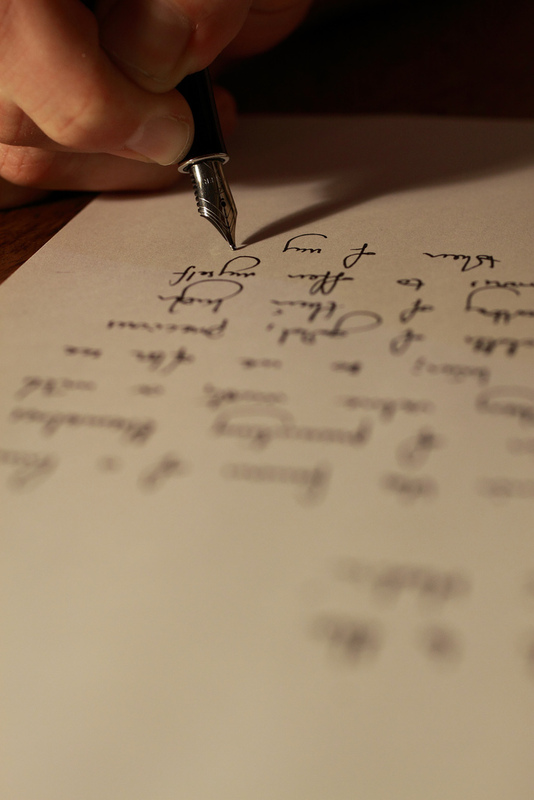 If your children have studied calligraphy at home, this unit lends itself well to writing out at least one or two of the poems with a calligraphy pen. As Dorit Winter notes, ” Fundamental to both wonder and imagination is observation.”(17) So, for the first 20 minutes of the main lesson, I had them factually describe (in writing) an ordinary household object that they had brought to class. I did a toaster. Before we attempted to describe our objects poetically, we turned to some of the fundamentals of poetry, what I called in their handouts” Pillars of Poetry.” We began by discussing what tone is in poetry (mood of the poem, how it makes us feel). I read out loud “My Heart Leaps Up” by Wordsworth and we discussed the tone of the poem. We also compared prose examples of wonder, such as “The Human Eye” ( 7 in Schwartz book), with poetry and noted their similarities and differences. We then did a fun object poem, Emily Dickinson’s ” I like to see it lap the miles” and discussed both the tone and the use of metaphor in the poem. I had created and copied a handout on Poetic Examples that showed examples of Assonance, Alliteration, Simile, Metaphor and Onomatopoeia as well as examples of Iambic, Trochee, Dactyl, and Anapest meters that they could use as a reference in analyzing poems. We used this guide to find examples of alliteration and assonance in the Dickinson poem as well as looking at the meter. We read aloud other poems like Blake’s “The Tyger” and discussed tone and worked to figure out the meter after listening. It is Trochee meter in the Blake poem, a falling rhythm like a blacksmith’s hammer. Finally, we looked at the rhyme scheme of a poem, its pattern of rhyming words and its arrangement in stanzas. I would be assigning them couplets, tercets and short stanzas for homework that week. We read and discussed Robert Frost’s Stopping By Woods On a Snowy Evening. I went to the blackboard to write out the first line so we could figure out its Iambic meter and then we looked at our printed copy and assigned alphabet letters to each end rhyme word in a stanza. We looked at how the poet’s repetition of lines at the end influenced the tone and meaning of the poem. In the last 15-20 minutes of the main lesson, we went back to our household objects and wrote about them poetically and shared them. The Assignment for week one included preparing for a spelling quiz for the next week (primarily on poetic devices and meter names) and then writing a few examples of couplets, tercets, and short stanzas. They also had to memorize a poem and recite it in class for the next week as well as create an original composition or poem on one of the following : a written portrait of a family member of pet; a description of a painting; a description of something you found wondrous; an artistic description of a scene in nature). They were also to start choosing a famous poet they admired. A short biography of the poet’s life, and what they admired about him/her, along with a copied poem of the poet’s, would be due the last week of class. It took about the first hour of our second class to take the spelling quiz and recite the memorized poems and review the homework examples. For the remaining portion of the class, we went over a handout I had prepared on what I called “Wordplay and Screenplay” showing examples of the visual effect of a poem. Poems that actually look like their subject visually are called concrete poems. One such poem is called ” The Sidewalk Racer or On the Skateboard” by Lilian Morrison which visually looks like the shape of a skateboard on the page! The poetic form I focused on for this week was Haiku. We went over a handout I created of famous Haiku poems. We continued to look at poetic elements in various poems and our implicit theme for the week was nature poems and poems about wishes, all of which were copied for them. We also looked at free verse poems. The Assignment for week two was to review their handouts and write at least three Haiku poems and a free verse poem. They were also to write a poem or prose composition ( see Winter, 32) on one of the following topics: a wish for the earth, a wish to improve yourself, a wish for the future. They were also to finish their biography of a famous poet and rehearse the chosen poem so it could be read aloud to the group. In our last class, a good portion of the class was listening to and commenting on all of the homework from last week. We had a short handout on poems that had a surprising element or theme to the poem. I then read a short poem I wrote with a surprise ending that led them to the dining room where ( in the case of the girls class) a tea party with home baked goodies was spread out for them to enjoy as a tasty culmination to all their poetic efforts! I thoroughly enjoyed this class each time I taught it and was touched by the poetic feelings and efforts of the students. Thank you very much for this helpful outline showing how you approached this block.